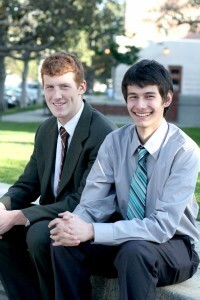 Undergraduate Student Government presidential candidate Jonathan Munoz-Proulx and his running mate Ryan Walsh are hoping to increase the efficiency of Campus Cruiser, open Doheny library 24 hours a day during finals, make student football tickets transferable and better promote student organizations. Munoz-Proulx, a junior majoring in theatre, and Walsh, a sophomore majoring in computer science, are the only executive candidates who have never held elected office in USG. 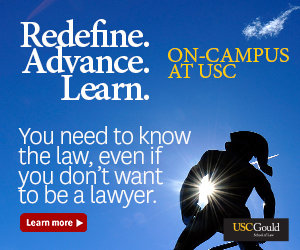 They are hoping to win office to help improve students’ experiences at USC. “I would love for the opportunity to spend my last year here working 20 hours a week doing nothing but making this experience as great for everyone as it has been for me,” Munoz-Proulx said. Despite their lack of USG experience, Munoz-Proulx said they are not “overwhelmed or intimidated” because they believe their work experiences, including serving as orientation advisors, are a great strength. Munoz-Proulx is a tour guide and sits on the USG Campus Affairs and University Affairs Committee. Walsh has been a business and house manager for engineering fraternity Sigma Phi Delta. Instead of focusing on experience, the two are running a campaign based on research and preparation. They have, for example, been researching other schools’ student governments and attending Senate meetings. The pair has been looking into Harvard, Columbia and other private universities to learn about their student governments. “It’s not until you start researching other schools that you see what’s really possible,” Munoz-Proulx said. For example, he proposes copying Stanford University’s “green student store” by having either an online store available during the summer or a booth during move-in week selling environmentally-friendly items like soap, cups and power strips. Encouraging turning off unused lights, installing solar panels and replacing energy-draining laundry machines are on the platform as well. The duo said its most valuable research has come from talking to students, and it thinks its knowledge of the issues important to students will help it in the campaign. 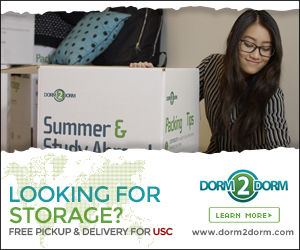 “I’ve heard prospective students and what they want out of a university, admitted students and why they matriculate to USC, and we’ve been learning about current students from four to five meetings a day with student leaders,” Munoz-Proulx said. Walsh said most of their ideas have been developed from student voices, including those he encounters through playing sports such as club rugby and driving for Campus Cruiser. Walsh believes an automated voice or text cancellation service would make Campus Cruiser more efficient. Currently, students must wait up to 15 minutes for an operator to cancel cruisers, which are required to wait five minutes for students. Residing outside of Campus Cruiser’s western service boundary, Munoz-Proulx sees demand for increased security west of campus. Another top goal is to increase contact with students via a weekly e-mail newsletter that would have bullet points of what USG is working on and a poster outside of the new student center to promote weekly events. “[Student leaders] have told us that a lot of advertising for events for students organizations aren’t about, for example, rugby games or lacrosse games or anything like that, so they’d really like to be better represented by USG,” Walsh said. He noted communication issues with the Greek community too. Instead of relying on Greek senators and councils, Walsh wants direct contact with fraternity and sorority presidents. Munoz-Proulx said he envisions small improvements in academics, such as opening Doheny Memorial Library 24 hours a day during finals week to remedy the lack of study space and posting online the teacher evaluations completed at semester’s end. “Students already fill out these evaluations, so why not make them available?” he said. Regarding meal plans, Munoz-Proulx said that for students living at Fluor Tower — which isn’t near either of the dining halls — meals aren’t as effective as dining dollars. He suggested either creating the “Trojan Light” plan — a compromise between the Cardinal plan and the Trojan plan that has been discussed previously — or not requiring a meal plan. He also recommended, similar to the Community plan, the ability for students to use meals for guests. Another proposal calls for the ability to transfer football tickets between two USCard holders or to donate tickets to local schoolchildren. Walsh said he wants to pressure professors to offer extra credit alternatives to the Joint Educational Project, which allows students to mentor at local schools but fills up quickly. Another point on their platform is offering free HIV testing in the health center all year instead of in February only. Jeff Toye, an undeclared sophomore and the designer of the campaign’s logo that features Munoz-Proulx’s initials “J.M.P.” within a patriotically colored Trojan helmet, said the candidates can reach all Trojans. “They are a real opportunity to make a difference on campus because they have the great ideas, like [all] candidates do, but also the determination and drive to get those done,” he said. To hear Paresh Dave’s full interview with Jonathan Munoz-Proulx and Ryan Walsh, click below.